These truffles were inspired by my Chewy Chocolate Chip Cookie recipe. Replacing the egg with toasted marshmallow gives you a tasty cookie dough that is safe to consume. I recommend serving the truffles at room or fridge temperature since the texture isn’t quite “cookie doughy” enough for me when frozen. Preheat oven to 350 degrees Farenheit. Prepare one cookie sheet with baking spray and another with aluminum foil. Place marshmallows on sprayed cookie sheet and bake for 2 – 3 minutes, until just beginning to brown. Set aside to cool. Use a mixer to cream together butter and sugars. Beat in vanilla and toasted marshmallows. Stir in flour, baking soda, and salt. Stir in milk. Fold in mini chips. Roll dough into heaping Tbsp sized balls and place on foiled cookie sheet. Put the balls in the freezer for at least 15 minutes. Melt milk chocolate chips using a double-boiler or microwave. One by one, place cookie dough balls in the melted chocolate and roll to coat them completely. Shake off any excess chocolate and return to cookie sheet. If decorating, be sure to sprinkle the truffles while the chocolate is still wet. 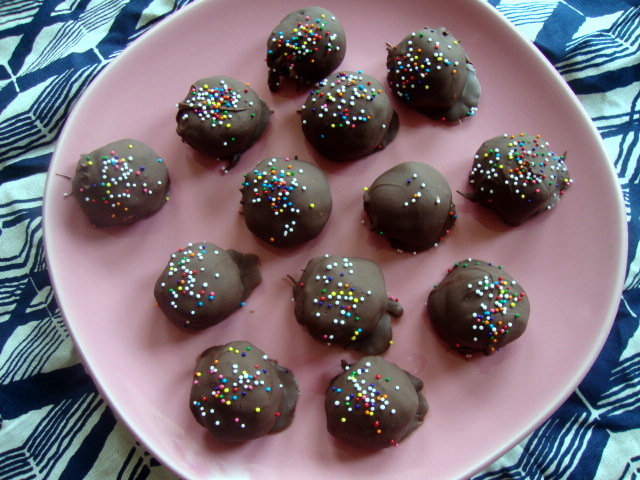 Return truffles to the freezer for 15 minutes so that the chocolate hardens. These are super cute! And they sound amazing too– who doesn’t love cookie dough? I need to make these sometime.